Our tag line says it best: we're "pure harmony." Vocal Majority is a Dallas-based men’s chorus of 100+ volunteer musicians who perform before thousands of people every year. Vocal Majority will perform in Salt Lake City this coming July! Sunday, July 7, we are guests of the Tabernacle Choir at Temple Square as we sing on their live worldwide broadcast of Music and the Spoken Word. The radio program will air at 9:30 am Mountain Time. After the 30-minute broadcast, we will perform in the Conference Center. If you will be in Salt Lake City for the BHS convention, we look forward to seeing you there! Our tag line says it best: we're "pure harmony." 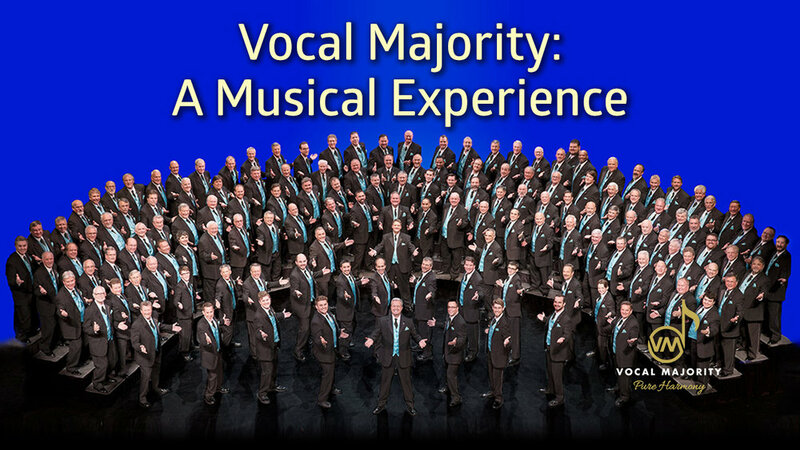 Vocal Majority is a Dallas-based men’s chorus of 100+ volunteer musicians who have performed throughout the U.S., Canada and the UK. The VM is non-profit Barbershop Harmony Society chapter and 13-time Gold Medal winners in BHS chorus competitions, with our most recent win in 2018. Men of all ages and from all walks of life amplify their passionate love of singing while touching the hearts of thousands of fans world-wide. Our lush, multi-layered harmonies and electrifying choreography make each performance an extraordinary experience. The Vocal Majority has released more than 25 albums, featuring our diverse musical repertoire that includes Christmas holiday, jazz, Broadway, pops, to time-honored barbershop, uplifting inspirational, sacred, and patriotic songs. Vocal Majority has something for every music lover! Listen and decide before you buy! With 30-second snippets of each of our over 250 song recordings now available for digital download, you can listen to about two hours of inspiring Vocal Majority music! When you’re looking for a musical performance that gets your audience on their feet and charged up for your event or meeting, look no further than Vocal Majority! Our lush, multi-layered harmonies and electrifying choreography make each performance an extraordinary experience. We’re Pure Harmony. As 13-time International Chorus Champions, our 100+ voices have inspired people for more than 45 years. We offer three performance length options. If your organization qualifies, you may be able to apply for a grant from the Texas Commission on the Arts to underwrite a portion of our fee. Join the conversation! Post your comment below.